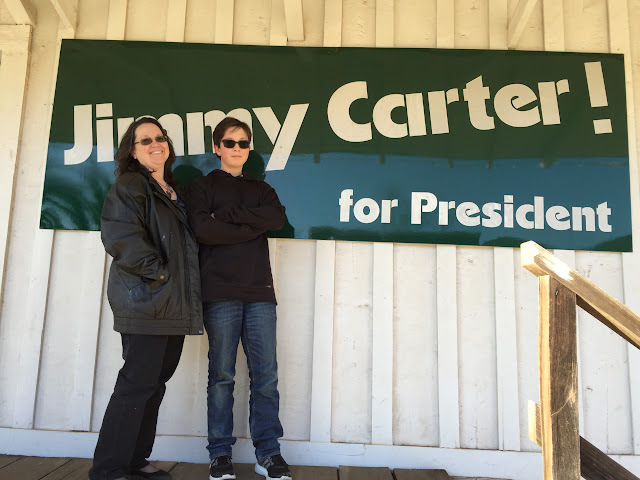 PLAINS, Georgia —When we learned last month that our sister-in-law Kathy and our nephew Steven planned to attend former President Jimmy Carter’s Sunday School lesson for President’s Day weekend, we decided to tag along. Since he shares Carter's October 1 birthday, Steven feels a special connection with Georgia’s only native son to occupy the White House, so attending one of Carter’s Sunday School lessons has long been on Steven’s To Do list. 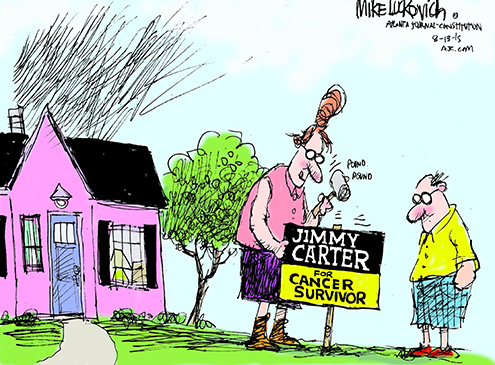 The announcement that the 91-year-old Carter had been diagnosed with Stage IV cancer renewed public interest in his Sunday School lessons. For most people, a Sunday morning visit to tiny Maranatha (mair’-en-ath’-eh) Baptist Church in Plains, Georgia, is their best opportunity for a personal encounter with a United States President. 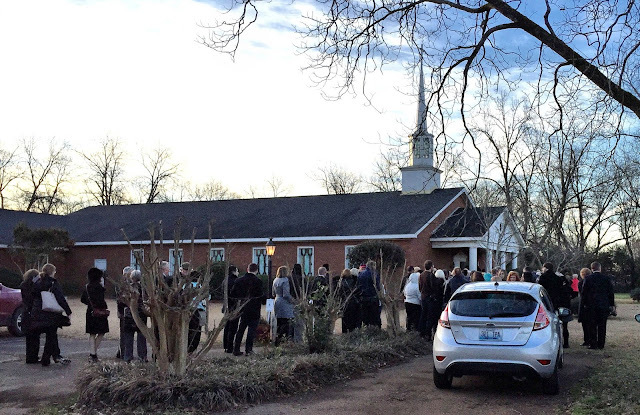 Suddenly reminded of the aging statesman's mortality, more than 1,000 people showed up in Plains on the Sunday following the cancer revelation, many sleeping in their cars in the church parking lot. Attendance has abated slightly since that August weekend, but a multitude of guests continue to flock to Plains to show their respect and affection for the ailing former President—usually more than the church's 300-seat sanctuary (and the 100-seat overflow room) can accommodate. As they always do, the good people who post reviews on Trip Advisor offered valuable insight into the logistics of how this small town (pop. 755) manages arrivals from around the world. Because visitors are admitted on a first-come, first-served basis, as the church web site noted, reviewers recommended arriving two hours or more before the building opens at 7:30 a.m. One person from Illinois reported getting to the church at 4:45 a.m. and getting in line behind others who had arrived before him. 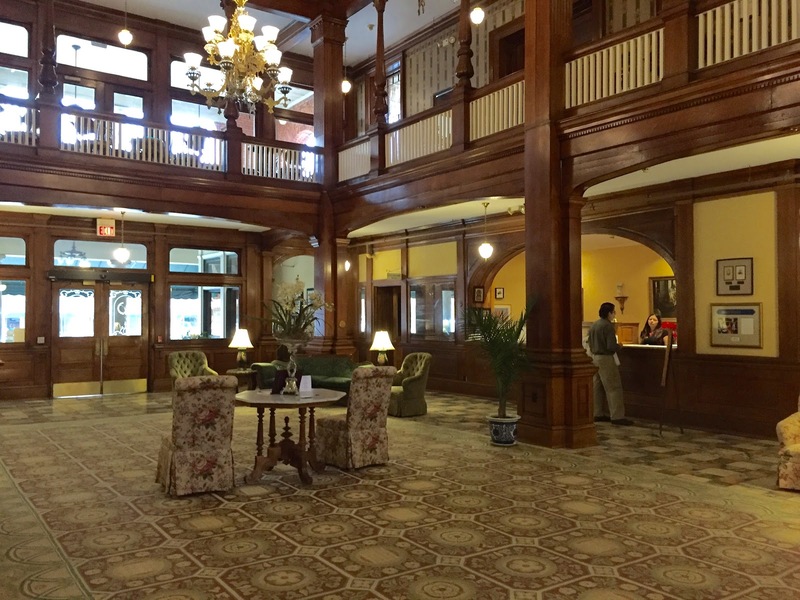 But the hidden gem in this mine of information was the report that those who are staying in one of the seven guest rooms at the local Plains Historic Inn (www.plainsinn.net) are invited to attend Sunday School as guests of the innkeeper, Jan Williams. 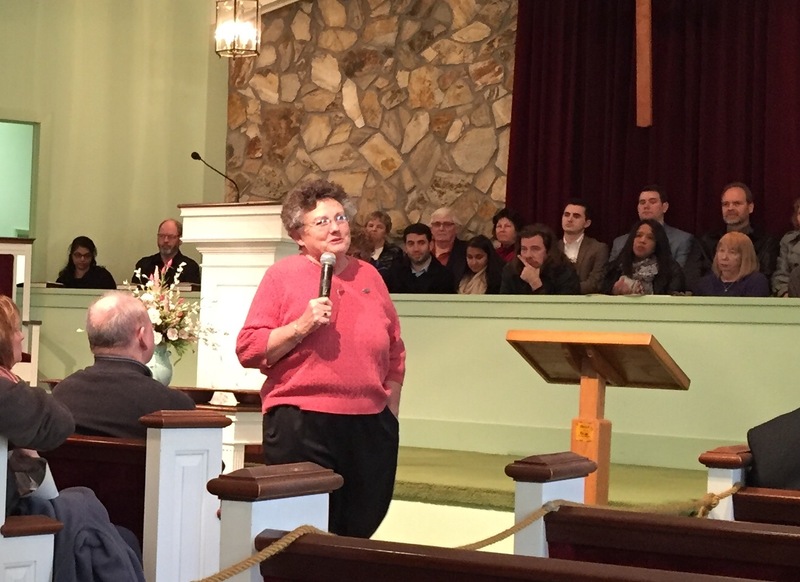 Not only is this retired fourth grade teacher, affectionately known as "Ms. Jan," a member of the church, she is also the drill sergeant who commands the weekly Sunday School crowds. Ms. Jan's word is law in this setting, and if you are her guest at Maranatha Baptist, you will enjoy the rare privilege of reserved seats in the sanctuary. 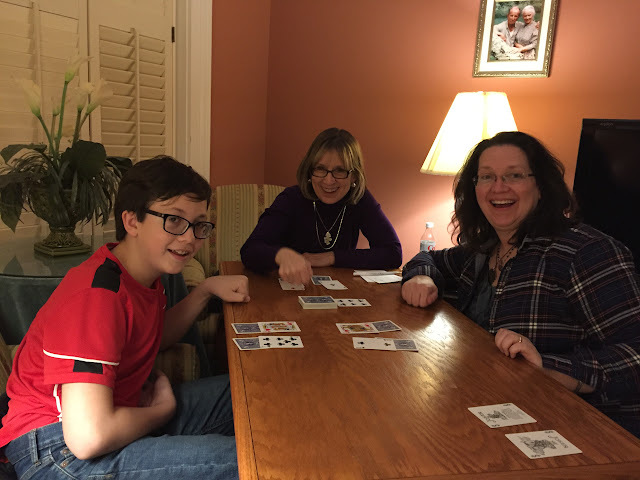 Though weekend nights are booked for the next six months, we were able to secure a room for Monday night, which came with the same Sunday School seating—because Ms. Jan decided it would. After Kathy and Steven spent Friday night in Peachtree City, we launched our Carter weekend on Saturday with the two and a half hour drive to Plains. Our reservation for the weekend was at the Windsor Hotel, a restored 1892 Victorian edifice that takes up most of a city block in nearby Americus, ten miles from Plains. With its imposing turret and a three-story lobby furnished with tufted velvet settees and lined with oak paneling and period chandeliers, the Windsor set the stage for an historic weekend. 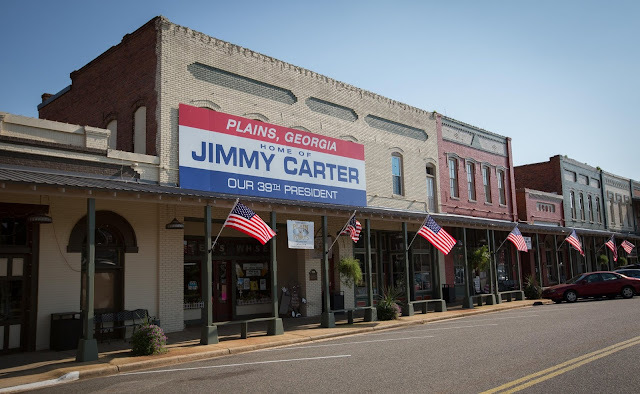 Arriving with plenty of time for sightseeing, we drove the short distance to Plains and visited the Jimmy Carter National Historic Site, a National Park Service entity comprised of the former Plains High School, Carter's boyhood home and family farm, and the railroad depot which served as his campaign headquarters. Closed in 1979 as county schools were consolidated, the high school that both Jimmy and Rosalynn Carter attended was repurposed by the NPS to serve as the visitor center and museum for the historic site. 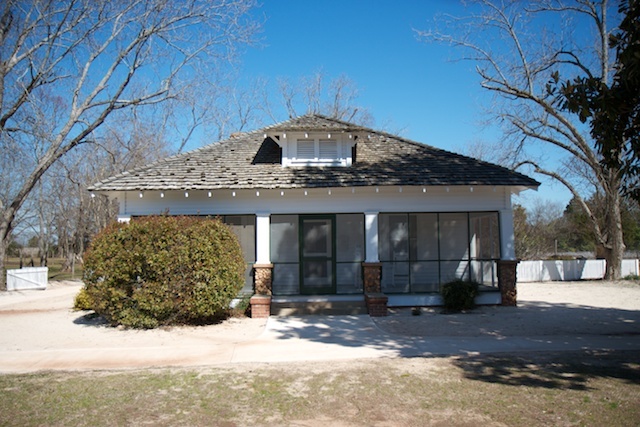 The school building features a restored classroom furnished as it would have been when the Carters were students there, as well as exhibits about the life and work of both Mr. and Mrs. Carter. Their high school English teacher, Miss Julia Coleman, was a particularly important influence in their development. In fact, Mr. Carter quoted her in both his 1977 inauguration speech and his 2002 Nobel Peace Prize acceptance speech: "We must adjust to changing times and still hold to unchanging principles." A calligraphic depiction of this quote is painted on the wall of the entry hall along with another prescient "Miss Julia" exhortation: "Students, always do your best. Someday one of you may grow up to become President." During the campaign, the depot saw 10,000 daily visitors who wanted to learn more about the peanut farmer running for President. After the school, we checked out the old Plains train depot, home of a self-guided museum with exhibits focused on the 1976 Presidential campaign. Built in 1888, the facility was closed in 1951 when passenger service to the area was discontinued. 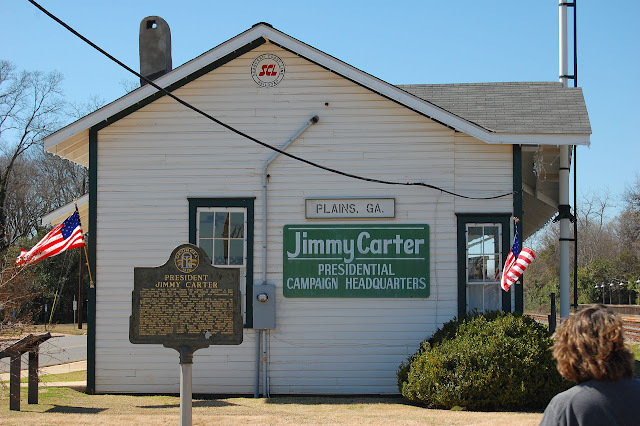 When Jimmy Carter decided to run for President, the old depot, which was the only available building with a restroom in downtown Plains, was selected as his campaign headquarters. Our exploration of the Carter National Historic Site continued three miles west of town at Carter's boyhood farm in the unincorporated community of Archery. 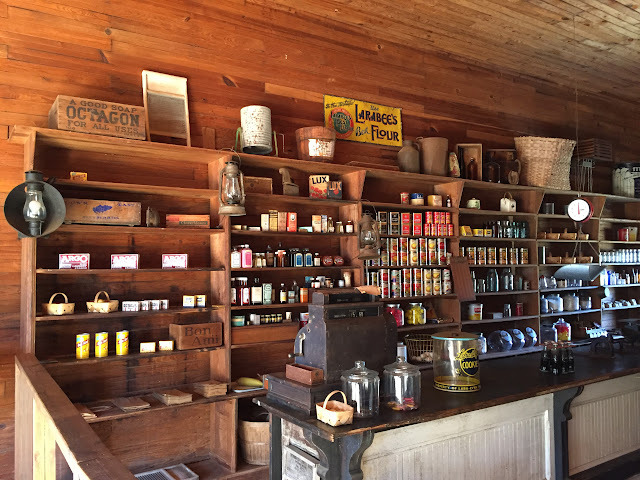 On the 360-acre farm, the Carter family raised peanuts, cotton and corn as cash crops and operated a small general store which sold basic necessities to neighbors. But the event that had drawn us to this rural corner of Georgia occurred the following morning. Despite Ms. Jan's license to arrive for Sunday School at 8:30 since we were her guests, we hedged our bets and arrived a few minutes before 8:00 to allow time for the Secret Service's security screening. Before entering the parking lot, each vehicle was subjected to a sweep for explosives by a Marine Corps K-9 and his handler. 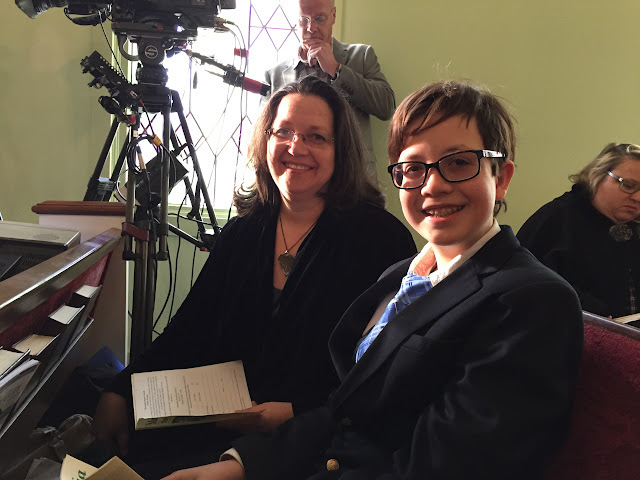 By the time we were about ten feet from the door, the others had joined me in line—just in time to hear Ms. Jan announce that the sanctuary was now full and everyone else waiting needed to walk around the building to the fellowship hall to watch the lesson on closed circuit TV. We all breathed a sigh of relief, knowing she was not referring to anyone who was her guest. After Secret Service agents examined everything in our pockets (we left purses in the car) and scanned us with a metal detecting wand, one of the church ushers (who turned out to be Ms. Jan's husband) escorted us to our reserved seats. Do not stand when he enters. You may take photos only when he asks where everyone is from. 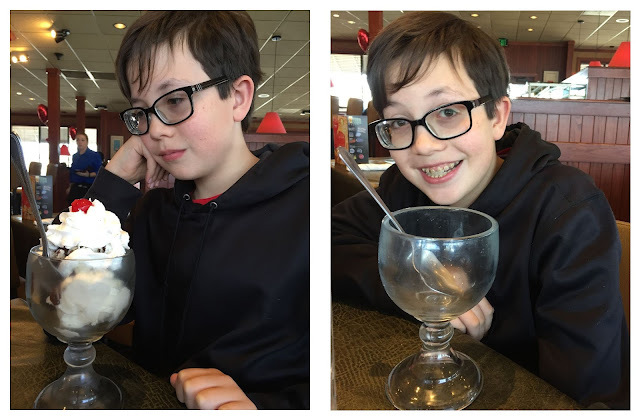 If you continue after that, I may borrow your camera and give it to the Secret Service. You will not have an opportunity to chat with the Carters. You most certainly may not shake their hands because he does not need the germs. Do not tell him your solution for world peace or invite him to lunch. Lest these admonitions sound too brusque, let me rush to say they were delivered with the humor of a stand-up comedian. Ms. Jan brooks no nonconformity, but she delivers her rules with a healthy dose of amusement and warmth that makes congregants as eager as her students probably were to please her. Finally at the 10:00 hour, President Carter quietly entered the sanctuary. "Good mornin', everybody," he drawled. With the experience gained from Ms. Jan's coaching and rehearsal, the congregation enthusiastically responded in kind. After thanking everyone for coming and ascertaining that the day's visitors came from 30+ states and six foreign countries, the former President talked briefly about work the Carter Center is doing to advance human rights and alleviate suffering around the world. Using no notes, Mr. Carter spoke for half an hour on the day's prescribed topic—eschewing empty ritual in favor of spiritual sincerity, compassion and acts of kindness to others. "God gives us life and freedom," said Carter, who has been teaching Sunday School off and on since his days as a midshipman at the Naval Academy. "Freedom to choose what kind of person to be. We need to choose peace, love, justice, humility and service." He emphasized the importance of accepting human diversity, caring for the poor and oppressed, and breaking down barriers between socioeconomic groups. And he encouraged those present to choose a tangible, specific goal to help them reach out to those who need help, remembering to do good for its own sake, not for any fanfare or publicity. Coming from someone who has devoted his post-Presidential years to humanitarian work, his message was compelling. After the worship service that followed Sunday School, Mr. and Mrs. Carter graciously sat for half an hour and posed with every group of visitors who wanted a photo with them, which was at least 99% of the guests. With Ms. Jan, who also serves as the church pianist, in charge, the process was just as efficient as you might imagine. Each group handed their camera to church member Jill Stuckey as they reached the front of the line. Jill took a couple of quick shots, passed the camera back, and the next group promptly stepped forward to do the same. Steven checks out an exhibit at the POW museum. 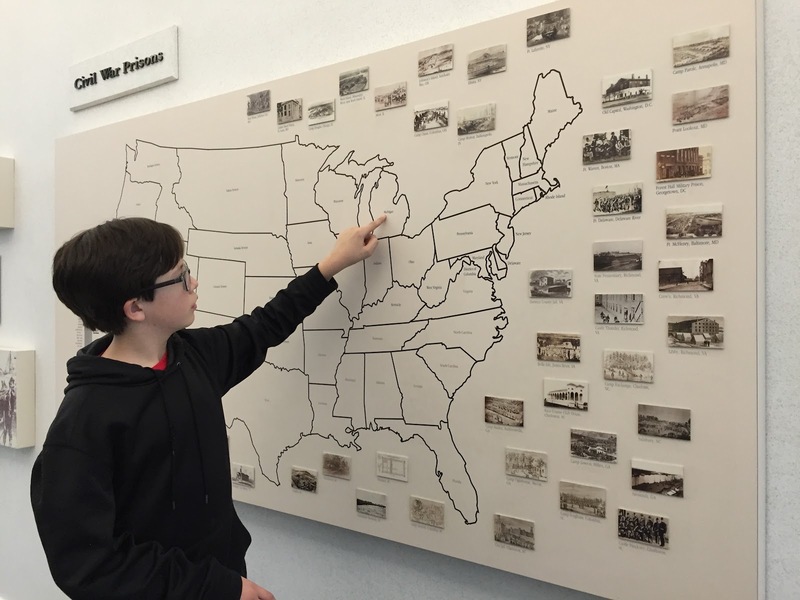 Having visited the National Historic Site locations on Saturday, we drove to nearby Andersonville Sunday afternoon to take in another NPS unit—the National Prisoner of War Museum. 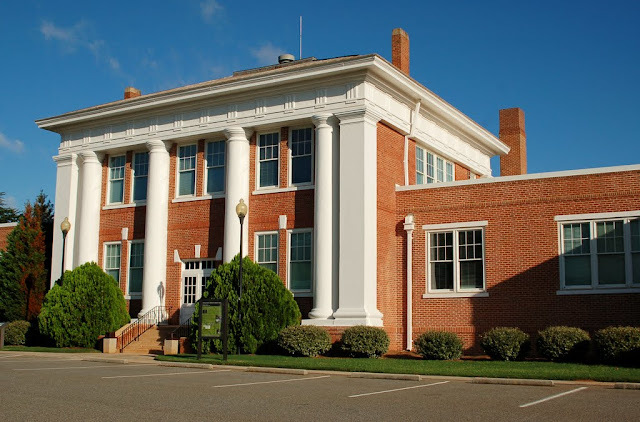 Located at the site of a notorious Civil War POW camp for Union soldiers, the museum offers exhibits detailing the hardships at what was no more than a vermin-infested, disease-ridden stockade. Other exhibits honor the courage, service and sacrifice of prisoners of war throughout American history. 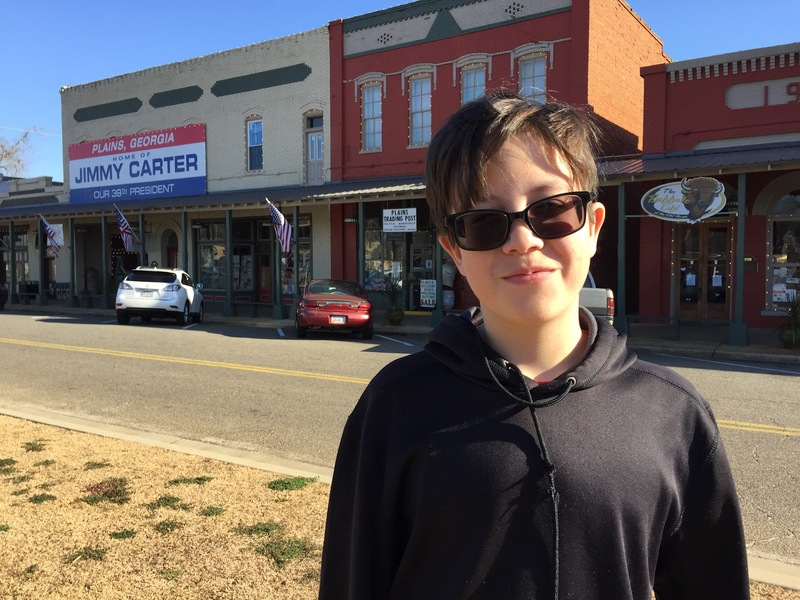 Since this was President's Day weekend, Steven had a school holiday so we extended our stay to attend a talk and book signing by Mr. and Mrs. Carter at the old Plains High School on Monday morning. 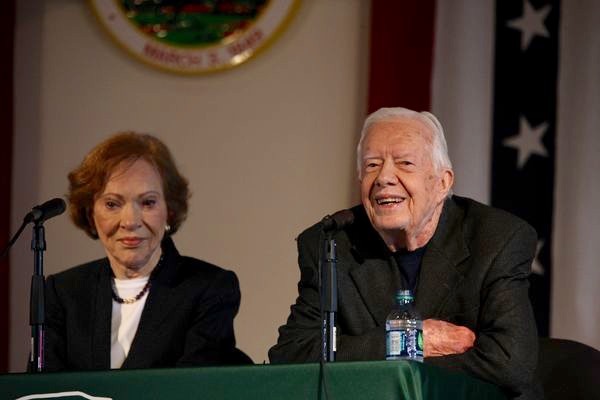 In her introductory comments, the National Park Service moderator noted that 2016 marks the 40th anniversary of the Carter Presidential campaign and asked both the Carters to address that endeavor in their remarks. The obvious humility and civility of both the Carters and those who worked with them on their historic grassroots campaign offered a stark contrast to the current venomous contests where professional political strategists spend hundreds of millions of dollars delivering onslaughts of media attack ads against other candidates. Neither Carter nor his opponent Gerald Ford raised any funds for the 1976 campaign, opting to operate using only the funds donated by taxpayers through the IRS. Mr. Carter decried the 2010 Supreme Court ruling which opened the floodgate for super PACs to raise and spend unlimited funds on political campaigns, lamenting the resulting polarization in the nation and the obligation of successful candidates to the big money donors who put them in office. 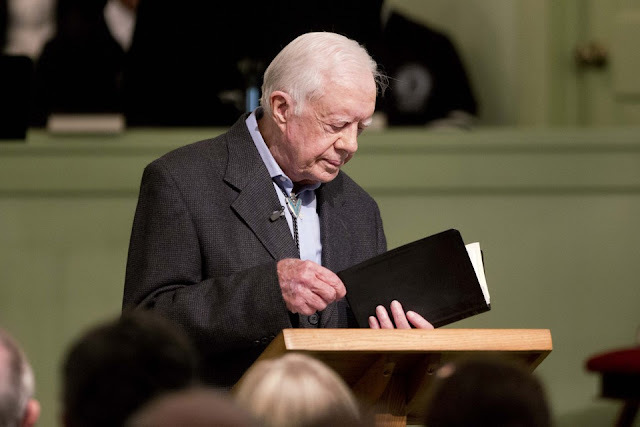 Though the aging Carter, who is still receiving immunotherapy treatments for cancer, appeared rather frail at Sunday School, he stood on his feet during the entire lesson. 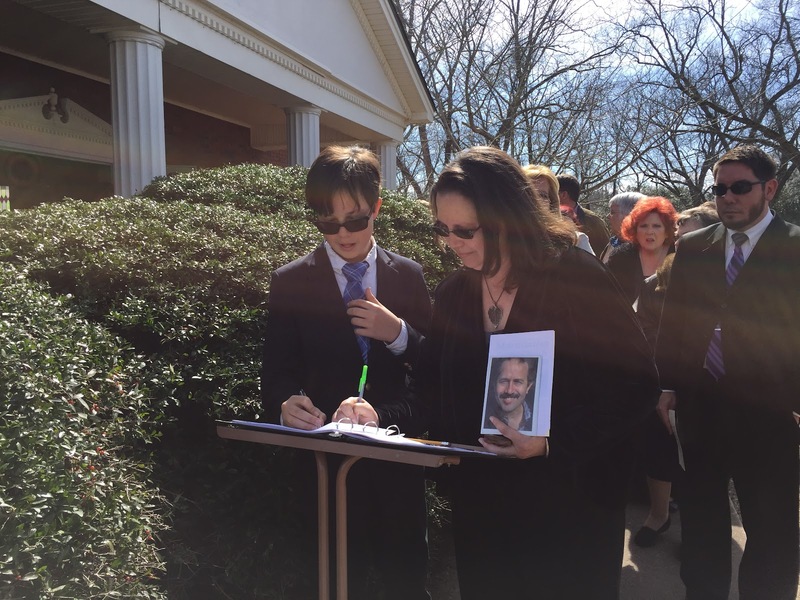 At Monday's event, where he was seated, he seemed to have renewed energy. Both the Carters signed copies of their books after the talk which was followed by a question and answer session. He has written 30; she, 5. After getting our books signed, we parted ways with Kathy and Steven, as they drove toward Tennessee and we headed home. It was a remarkable weekend. Where else could an average person attend multiple events and have such close encounters with someone who served as President of the United States? And every event, including the historic sites, was free of charge. What a contrast to the Clintons, for example, who have raked in a staggering $150 million in speaker's fees (including $12 million from nonprofit groups) since leaving the White House in 2001. Our weekend in Plains helped restore a little faith that there are still some people of historic importance who are not focused on extracting massive profits from their public service. 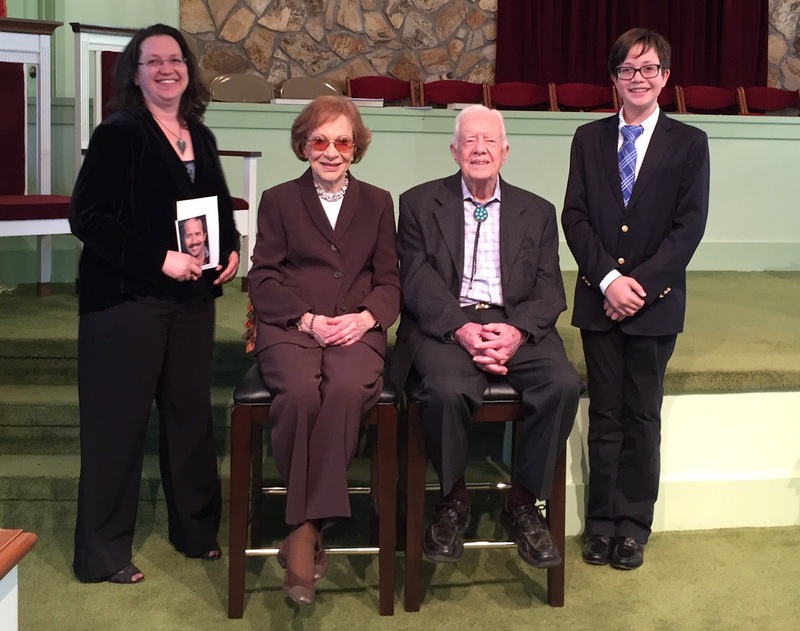 While he was in Plains for President's Day events, Jimmy Carter was awarded in absentia his second Grammy Award for best spoken word album, this time for the audio version of his recent memoir A Full Life: Reflections at Ninety. Frustrated with the refusal of Plains Baptist Church to integrate (only the Carter family and a few others voted to support it), a small group of dissenters formed Maranatha Baptist Church in the late 1970s, while the Carters were in the White House. When they returned from Washington to live in Plains, the Carters joined the new congregation. In this town of 755 with eight churches inside the city limits and a dozen more within a few miles, membership at Maranatha hovers around 35 people. The Maranatha church bulletin reported the previous week's Sunday School attendance: Members - 33, Visitors - 299. Bob Graham, former Governor of Florida and U.S. Senator from that state, attended Sunday School and worship with a large family group. Mr. Carter recognized him and asked him to read the Biblical passage for the lesson. 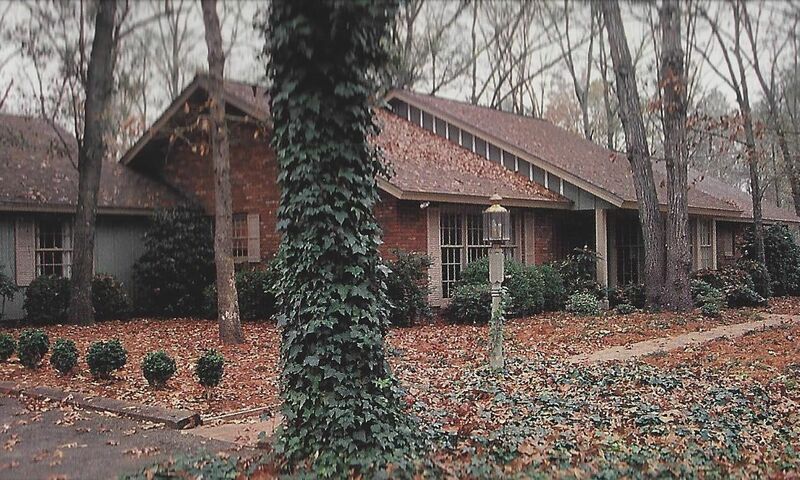 The Carters live in a ranch house they built in 1960, the only home they have ever owned. Renovated and enlarged after they returned from the White House, the home will become the property of the Jimmy Carter National Historic Site after the Carters' deaths and will be open to visitors. Jimmy Carter is the only U.S. President who taught a Sunday School class while in office. President Carter spends a week in Atlanta each month, tending to matters at the Carter Center and teaching at Emory University. As an example of the Carter Center's impact, they trained 7,000 medical workers and 30,000 health workers (2 per village) in Ethiopia at the request of that nation's government. Subsequently, antibiotic treatments for trachoma, the number one cause of preventable blindness, were distributed to ten million Ethiopians in five days. The week before we heard him teach Sunday School, Mr. Carter had spoken to the British House of Lords on the work of the Carter Center in eradicating disease in the developing world. For the last 34 years, Mr. and Mrs. Carter have annually spent a week working with Habitat for Humanity building affordable houses for people in need, both in the United States and abroad. 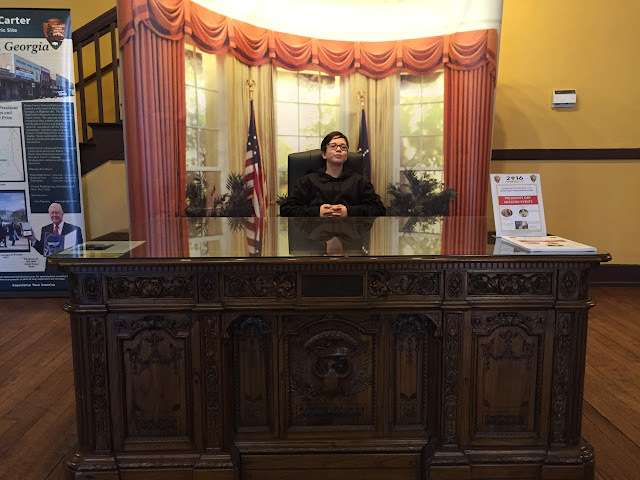 Steven checks out a replica of the Resolute desk used by every President—except Johnson, Nixon and Ford—since 1880. Kathy and Steven are on board for the campaign. 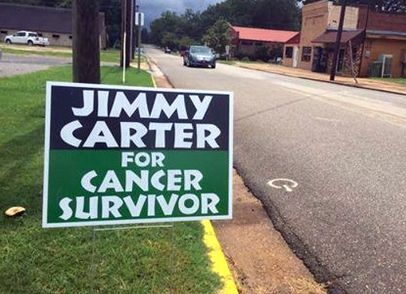 When Carter returned to Plains after his diagnosis, he was greeted by campaign-inspired signs posted by his friends.